1. Brand new homepage layout for an improved browsing experience. Check out the new eSports tab for curated content and exciting news in mobile gaming!. 2. Keep track of your top stream supporters on the new Supporter Leaderboards.. 3. Message requests now allow you to start a chat with anyone without mutually following.. 4. Do Not Disturb mode silences all notifications while streaming for a distraction-free experience.. 5. Performance improvements and bugfixes. 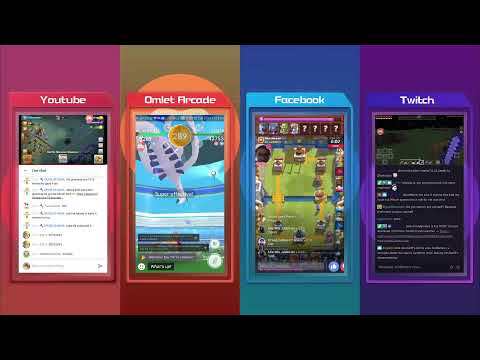 Omlet Arcade is the easiest way to live stream and record all your favorite games including Minecraft, Clash Royale, Rules of Survival, Arena of Valor, and more. Show off your gameplay by streaming to Omlet, Facebook, YouTube, or Twitch! Open any game and a floating button will pop up, letting you l... see more Omlet Arcade is the easiest way to live stream and record all your favorite games including Minecraft, Clash Royale, Rules of Survival, Arena of Valor, and more. Show off your gameplay by streaming to Omlet, Facebook, YouTube, or Twitch! Open any game and a floating button will pop up, letting you live stream and chat without any messy setup.